Tamarind made waves in 2001 when it became one of a hand full of Indian restaurants in London to win a Michelin star. Executive chef Alfred Prasad ran a number of restaurants in five-star hotels in Southern India before coming to the UK in 2000. The food at Tamarind draws its influences from North-Western and Southern India and offers a modern interpretation of Moghul cuisine, the ancient courtly food of Rajasthan that centres round Tandoor ovens. 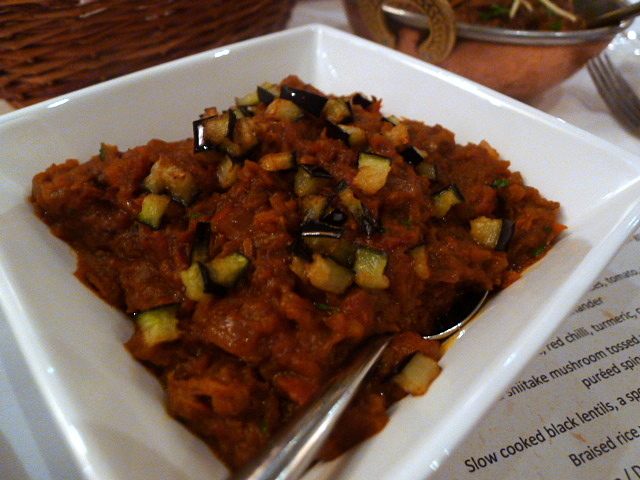 I dined at Tamarind at the invitation of the restaurant along with a number of other guests. The prices listed below are for the à la carte portions. We started with pudhina chops, ginger, turmeric and mint coated lamb cutlets served on a chilli-yoghurt dip (£10.25). This was accompanied by aloo tikki, sago crusted potato cakes on a bed of spinach and topped with tamarind chutney (£6.95). 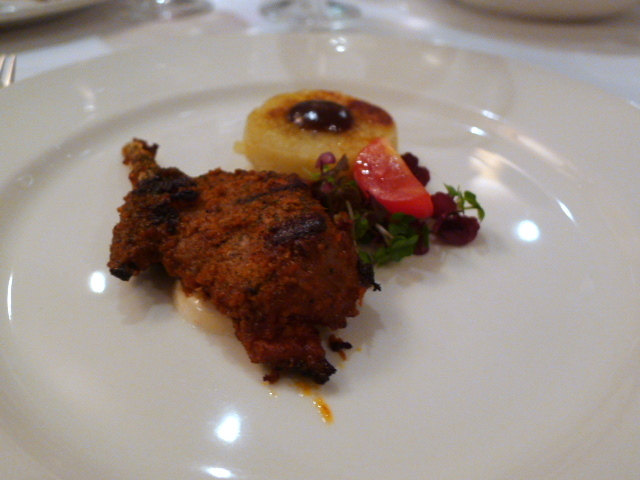 The lamb was tender and the potato cakes yielded a lovely texture, although the tamarind chutney was a touch too sweet against the potato. 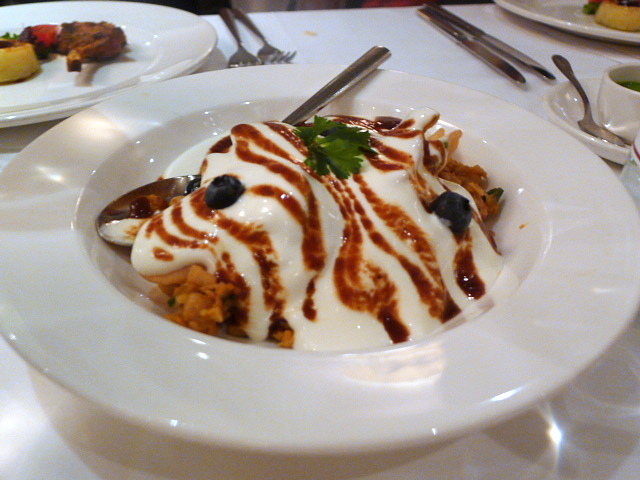 A side dish of papdi chaat, spiced chickpeas, whole-wheat crisps and sweetened yoghurt topped with blueberries and tamarind chutney (£7.50) was lovely with its creamy and chilling nature. 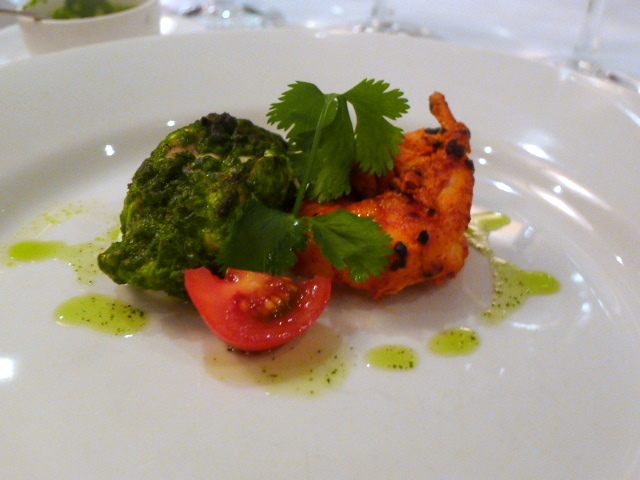 Our mains included kalonji jhinga, tiger prawns marinated with ginger, yoghurt, ground spices and toasted with nigella seeds (£26.00) which was firm, meaty and succulent. Hariyali macchi, monkfish marinated with ginger, fresh mint, lime-leaf and green chilli (£24.50) was nicely cooked and moist but a little bland. 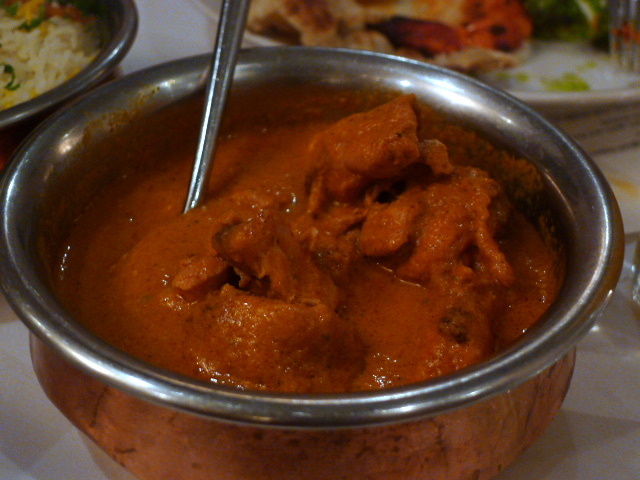 To go with our seafood, we were presented with sharing dishes of murgh makhni (chicken tikka) (£18.25) and lamb masala. The tikka was creamy and tasty, but the use of tomato was quite heavy in the dish leading to a slight imbalance in the flavours. 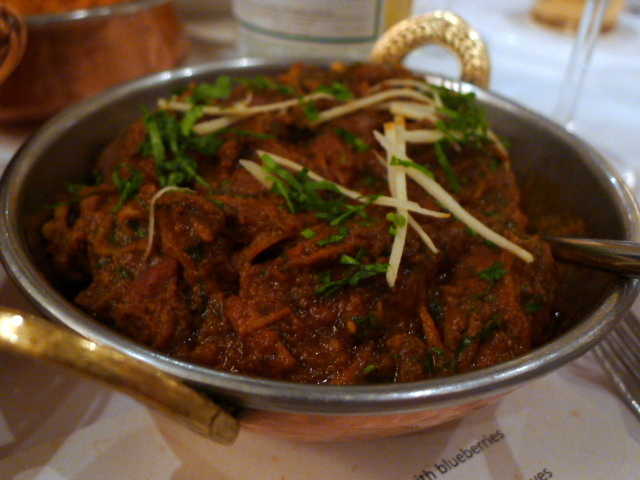 The masala was also tasty but lacked for the robustness of strong, fresh spices. Veggie sharing plates of baingan bharta, smoked aubergine pulp with garlic, red chilli, turmeric, cumin and fresh coriander leaves (£9.25) was lovely and yielded a wonderfully fine, smooth and silky texture. Saag aloo, baby potatoes and shiitake mushroom tossed with cumin, browned garlic and puréed spinach (£8.75) was also satisfying although a dish of dal makhni, slow cooked black lentils (£7.95) was a little dull. Rice and naan accompanied the meal. 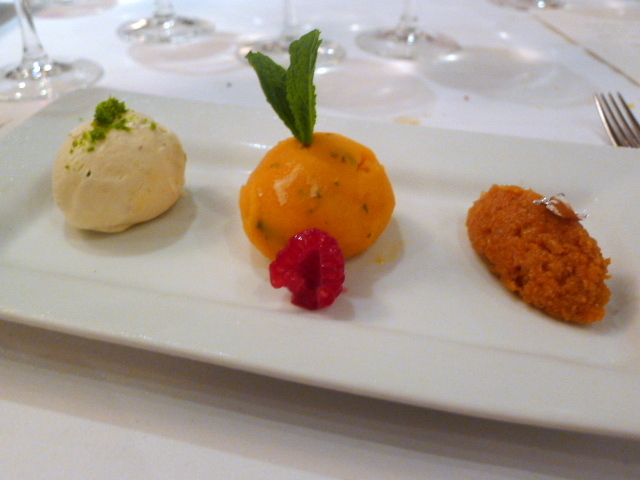 Desserts of carrot fudge, pistachio kulfi and mango and basil sorbet were lovely. Particularly delightful was the carrot fudge which was well judged with the requisite sweetness. I enjoyed this meal for it was decent and tasty. But considering Tamarind is a restaurant with one Michelin star, it wasn’t as awe-inspiring as what I expected it to be. The food was good and satisfying, but it never set my tongue alight with the exotic heady spicing that is the trademark of wonderful Indian food. The food I had at Moti Mahal and Chutney Mary recently was better, and neither of these restaurants have a Michelin star. And the à la carte prices at Tamarind can’t be considered cheap either. I have no issue with paying these prices for Indian food,, but I want the food to at a one star Michelin restaurant to enthrall me and Tamarind fell just a little bit short. Price range: £41 – £64 for three courses, a side of veg and bread of rice. Excludes drinks and service.